You can never have too many baby blankets, or at least that is the way I feel. I have a hard time not buying more all the time. 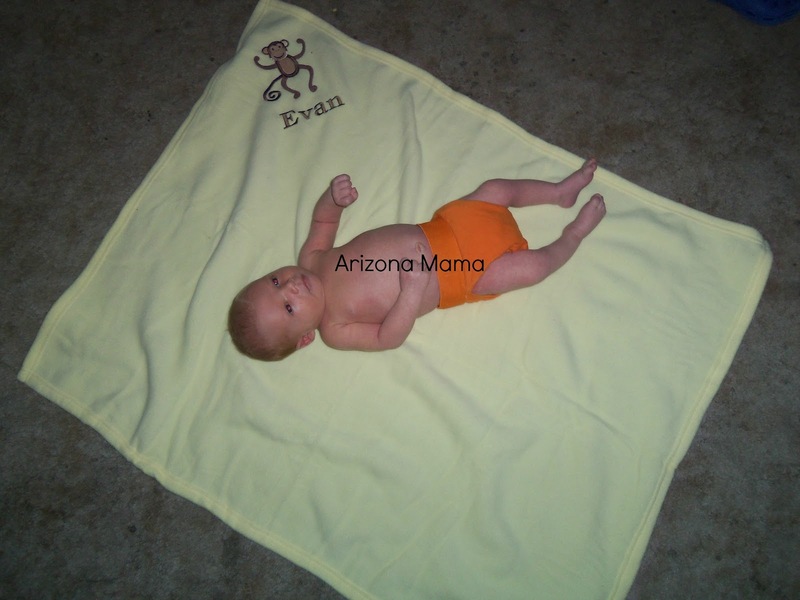 There are so many cute, soft, and usable baby blankets out there. But the ones I love best are those that are personalized. I came across My Embroidered Gifts and found a large array of beautiful baby blankets that can be personalized. I was excited when they offered a review and a giveaway. I started by looking over the site and there were so many cute things it was hard to decide which to pick. The site carries many different name brand products and then personalizes them to your liking. I love to give personalized gifts as well as receiving them. My Embroidered Gifts has gifts for baby, children, and adults. You can purchase these great gifts for any occasion. After looking over the site I decided on the Monkey Magoo. I could not resist this cute monkey and blanket set. The Monkey Magoo is a super cute plush monkey with velcro on his hands and feet. He comes hugging a cute banana gift box. Inside the box you will find a 30" X 36" yellow fleece blanket. The blanket is embroidered with a cute monkey and the name of your choice in brown. You can also request the name in a different color. When choosing the embroidery for the name you can also choose between 5 different fonts. I was able to get the blanket with Evan's name on it. The whole set arrived and was so cute I didn't want to uses it. The monkey and banana box will look so cute as decor in Evan's room and the blanket is soft and usable for just about anything. My Embroidered Gifts has many great products for gift giving such as a baby shower gift, wedding gifts, Valentines Day gifts, etc. They carry many items that can be personalized for the special one of a kind touch. Enter in the Rafflecopter form below! This giveaway will be open until 9/14 at 12:01AM (EST). Thank you to My Embroidered Gifts for sponsoring this review and giveaway. I love the Happy Blankie Personalized Blankets. I love the "Jakka the Giraffe" Little Expeditions Plush Rattle Lovie with Crinkle Leaf! Fun way to surprise my kiddos with soemething! I think I would get the Personalized Towel Wrap in black and pink for my oldest daughter! I like the Pancake Frog with Blanket Personalized with Embroidery. I like their Flatofrog Cozy with Personalized Embroidery - so cute! My daughter is having her 2nd baby and I would like to give the new baby something special! I would get the Lamb Plush Teethers by Mud Pie. I would get the Mud Pie Santa Gingham Stocking Personalized. I want to win this because my daughter does not have a personalized stocking. Ithink I would get the Pink Minky Blanket Personalized. Love the Happy Baby Blankie! I like Peek A Boo Bear by Baby Gund. I would love to win this for my baby. I might buy Boo the World's Cutest Dog if I won. I want to win something cute for my daughter. I want to win this to give to my niece. She is due soon with her second child. cause my son love sblankies and can never have enough! I would get the Sock Monkey Plush Blanket Personalized. I want to win this because I sewed a personalized blankie for my daughter and my son deserves one too, but I haven't found the time to make him one. Cutsie Caterpillar Baby Blanket is sooo cute!! I love the Girl sock monkey plush blanket. I don't have a lovey yet for my daughter, but I'd love to get one for her for the swaddle to no swaddle transition coming up. first baby due in february, so this is perfect. thanks! Winky Mini Comfy Cozy Blue Personalized and Birthday Message Bear by Gund Personalized are so cute! For my grandsons, cause they are cute items! I would LOVE to get the Pink Minky Blanket Personalized! I want to win this, because I'm having another little girl next month!